Since upgrading to our 45lb Mantus Anchor, our ground tackle has consisted of this fabulous anchor, 6 feet of (some sort of) chain and 200 feet of line. Before leaving we had planned on putting 100 feet of chain on the anchor to give us even more holding power but at somewhere between $4 and $6 a foot that was going to be a fairly hefty - but necessary - upgrade. As luck would have it Gayle and Jon, who also gave us the great inverter advice, who also did the same trip we're planning, happened to have some extra chain from their trip. They took off with 250ft of 5/16" BBB chain and only used anything over 100ft a time or two. They had sold the 100ft of chain they used but had 150ft left over that they'd be willing to sell us at a great price just to get it out of their garage. Win/win. For about half the price of brand new chain, we got 150ft of chain, most of which had never touched the water. Sa-weet! 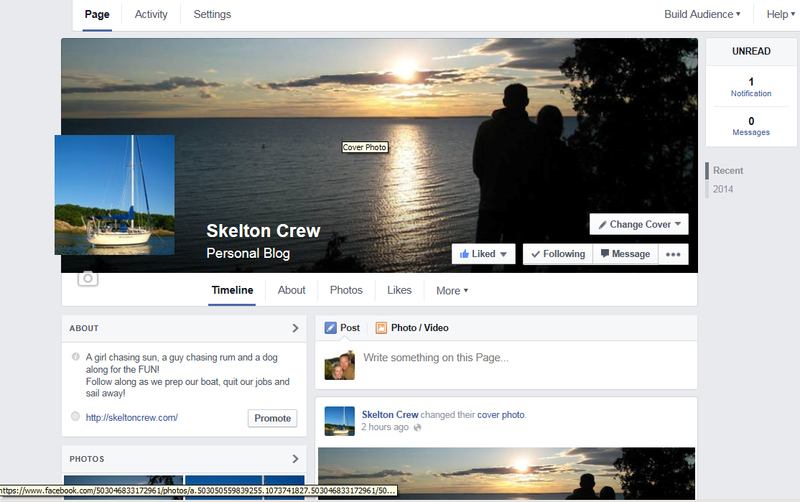 Just another example of why people in the sailing community are so beyond fabulous! We put 50ft of chain on the anchor for now. Before we leave for good we'll switch that to our other anchor (25lb Danforth) and put the 100ft on the Mantus. 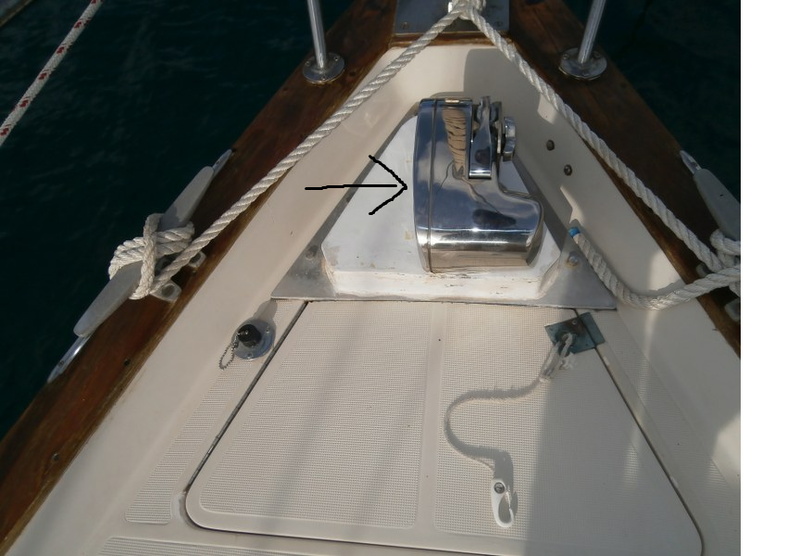 In order to be able to put the chain in the anchor locker and have it latch securely, Ron used the dremel attachment on the drill to grind down the opening on the front of the locker lid. It only took about 15 minutes to do and now our chain is snug and secure. It should also be noted that with this new chain (and weight in the water) yours truly is also sleeping better than ever on the boat. Yahooooo! 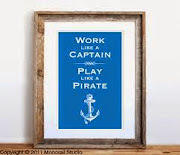 In case you're wondering if this will lead to us getting a windlass pronto the answer would be no. Actually, Ron thinks it's easier to weigh anchor with the chain, and I tend to agree with him. I was actually able to get the anchor and chain up on my own easier than I was just the anchor (which I couldn't do on my own if you remember). Go figure. Besides, he really enjoys pulling the anchor by hand and I kinda do too. 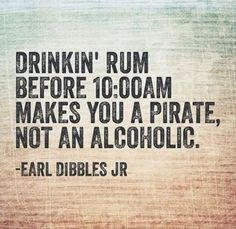 It's an intense little workout that gets the endorphines pumping pretty good and might even burn off some of the rum and cokes we sample! On Hullabalo we have 4 opening ports and, as with many ports, they are slightly slanted inward giving them fantastic water catchment qualities. Fortunately none of the ports leaks when properly closed up, but having water sitting on the seal for any length of time while we're gone is just asking for trouble at some point. Not only that, but shutting the boat up while waiting out rain makes the boat stuffy, hot and humid pretty quickly and we need air flow! After both Ron and I were unsuccessful at winning 2 of these port visors in another great giveaway from The Boat Galley (bummer! ), we sucked it up and bought all 4. 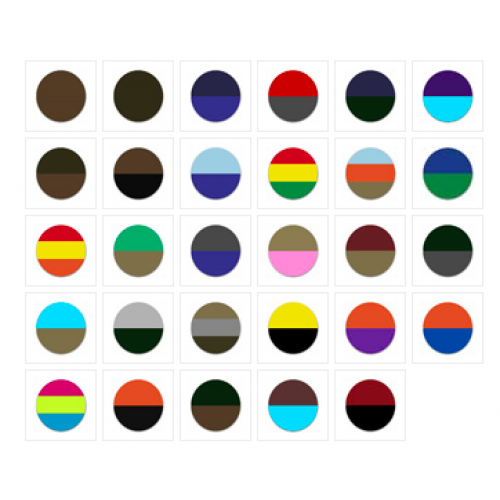 Ron measured the ports before we ordered ours, but Seaworthy Goods also has a handy dandy page where they put up pictures of their visors on customers' boats and specifically ask people to identify their type/size of boat and the size of visor used, genius right? AND there was actually an S2 11.0 on there, which helped reaffirm that we were actually ordering the right ones (18R in case you're really curious). It took all of about 20 minutes to put them on, easy peasy. Use the scrubber to remove any oxidation where the visor will be attached. Use clear paint thinner/acetone to wipe down the area, let dry (very quick). Remove the backing on the tape and stick 'em on! Ron "my eyes are more accurate than a tape measure" did the final placement of the visors and I went behind him and put an additional minute or two of pressure on the visor to make sure we got a good stick. the top of a couple visors, I'm happy to report they didn't budge. At.All. I loved finding this little hand-written thank you, what customer service, makes me feel all warm and fuzzy inside! Plus their little closing line is pretty cute too! In contuation of our conversion to LED lights on Hullabaloo, the next step was to mount an LED anchor light on the top of the mast. I'd done some research and found that you can't simply replace old lights with LED bulbs like we did inside the boat, instead we needed to get a whole new fixture because the lens in the light also makes the light more visible and simply adding an LED bulb won't result in the desired brightness (or US Coast Guard regulation). As I mentioned in the last post, when Ron went to switch out the fixtures, the triangular base of the new light was too wide for the space where the old one was. We needed the lens, the bulb and the wiring from the new fixture but not necessarily the base so Ron got busy working some magic and he managed to remove the new lens and epoxy it to the old base with all the new 'innerds' if you will. Saved us from having to drill more holes in the mast and move wiring (without dropping it down the mast!). So now we have a new light in the same place and it works fantastic! Sure we seriousy voided any warranty coverage by doing this little modification, but we're good with that. Sometimes he's a bit of a genius, that guy. Forget the anchor light for a minute; that was a gorgeous evening right?!? Frankenbulb - a work of art! Okay, so we only used our new LED anchor light one night when there were only two other boats in the anchorage but our light blew theirs away! The cool blue color of the LED light just seams to stick out much more than the incadescent lights, especially with interference from lights on shore. Notice the cool blue color (us in the middle) vs incandescent (on right and far left...which you can barely see). We were also quite a bit closer to the far boat than the one closest in this pic. At some point, unless you've got money to pay someone else to do it, you'll need to go up the mast. Whether it's for maintanence, inspection, repairs or projects you'll need someone to go aloft and having the right gear can make all the difference. We've been trying to get by on the cheap by using my brother's old climbing harness to go up the mast when needed. It served it's purpose by getting someone up the mast but was by no means comfortable or pleasant for the person in it. Last weekend Ron went up the mast to replace our old anchor light fixture with a new LED one and came down in a total tizzy. Forget the fact that the new fixture didn't fit in the space, it was the climbing gear that he was ready to burn. Apparently it's a little difficult and uncomfortable to be bouncing around in the rigging with no feeling in your legs. Needless to say, when we got home that night we ordered a Bosun's Chair. With a padded seat, backrest and tool bag this bad boy is the Cadillac version of our old jalopy system. I'm not sure why, but I thought these things were like $300-$400 so I was pleasantly surprised when we got ours on sale for $100! Now I feel a little bad about repeatedly sending Ron up the mast in the climbing gear knowing a simple and affordable solution to his misery such as this existed. Oops. The next time Ron went up the mast in the chair, he was comfortable enough to take his time finishing the LED anchor light fixture install and do a little rigging inspection, and best of all, I think he actually had fun doing it. Other than dealing with more waves than normal, he said he could stay up there all day (whaaaaat?!?). That's the kind of attitude 180 that makes buying a good mast climbing system (of which there are many options) totally worth the cost. If you don't have one already, just get one, you won't regret it. You'll need it, you'll use it. Learn from our pain. Please. Ron happy enough in his new chair to stop and take a picture. Mission accomplished. Remember the ongoing anchor light issues we had last year? 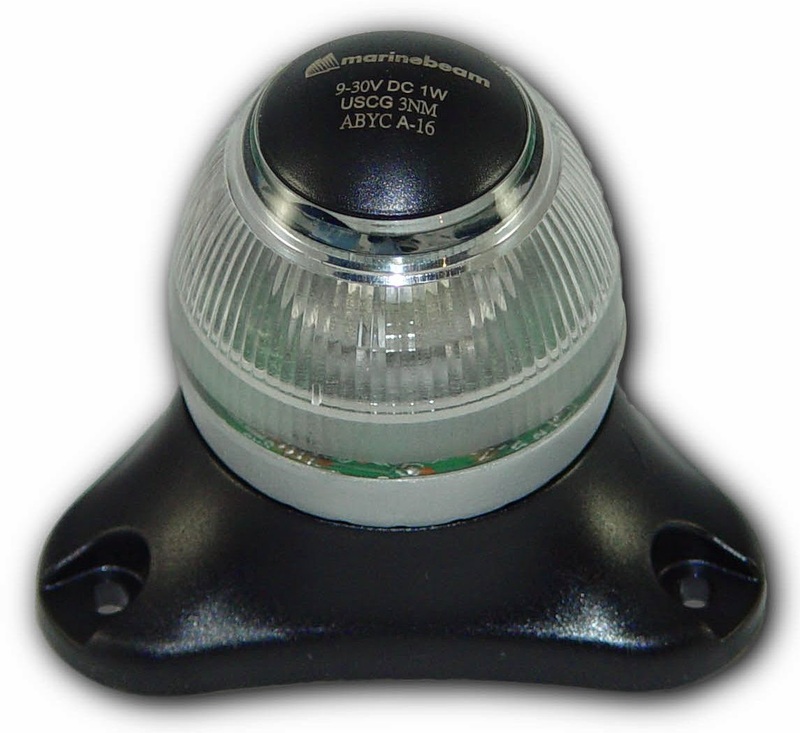 No, we haven't had any more problems with it recently, thank God, but since then I've been wanting to get a back-up anchor light, the kind we can plug in and hang up so others can actually see our boat at night. Always a good thing. At the same time, we also needed a cockpit light. Okay, need may be a bit exaggerated, maybe it's more like want. I wanted a light not just for sitting in the cockpit after dark (which is ually somewhat buggy if winds are light anyway), but for security purposes. I'm a bit of a worryer in that regard and I think simple actions can go a long way in preventing theft/vandalism due to simple opportunity, something we'll need to keep in mind as we travel about. I like my stuff, I'd like to keep it. Enter the Davis 3300 "Mega-Light" Anchor/Utility Light. Not only is this light visible from 2 nautical miles away (something required of an anchor light), but it sips battery juice (as in 1 amp over a 12 hour period!). The lens has two functions, which it does simultaneously - which took me a few minutes to figure out. The bottom of the lens is made for lighting up the area below it (cockpit light function) and the the sides are made for projecting the light long range (anchor light function). Plus it's made in the good 'ole US of A, can't go wrong with that! But what I like best about this gadget is that it has a light sensor on it that automatically turns itself on at dusk and off at dawn. Pretty sweet! So now if we're off the boat at dusk not only will this light come on automatically to help deter - in my mind at least - any unwanted visitors, but it will also help prevent bodily harm that can come from trying to climb aboard in the dark--> for us, not the unwanted visitors, remember they'll be scared off by our oh-so-bright light. 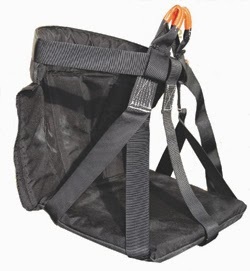 It also has a 15ft 12v cord that plugs easily into our 12v outlet just inside the companion way and gives us more than enough length to hang it either on the boom, bimini or rigging depending on where we want the light. 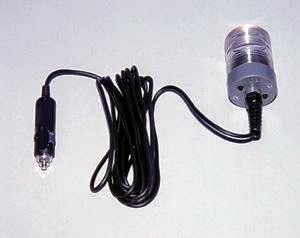 Not gonna lie, I was kinda looking forward to some nice rope lights for cockpit lighting but this light is multipurpose and the set-up is simple--> 2 things you really need/want on a boat. And at under $40 you really can't go wrong! Up until now we've only been able to use the various outlets around the boat when plugged in to shore power. And for those of you counting, that has only been a handful of times. When just staying on the boat for weekends at this point, that's not really a big deal. We have a cheap inverter that plugs into a 12v outlet (ie cigarette lighter in a car) that has normal plugs so we can still charge phones and computers and that's just about all we need now, however, once we are living aboard we would really like to be able to use these outlets around the boat and not be stuck to only 2 potential plug-ins limited to the galley. 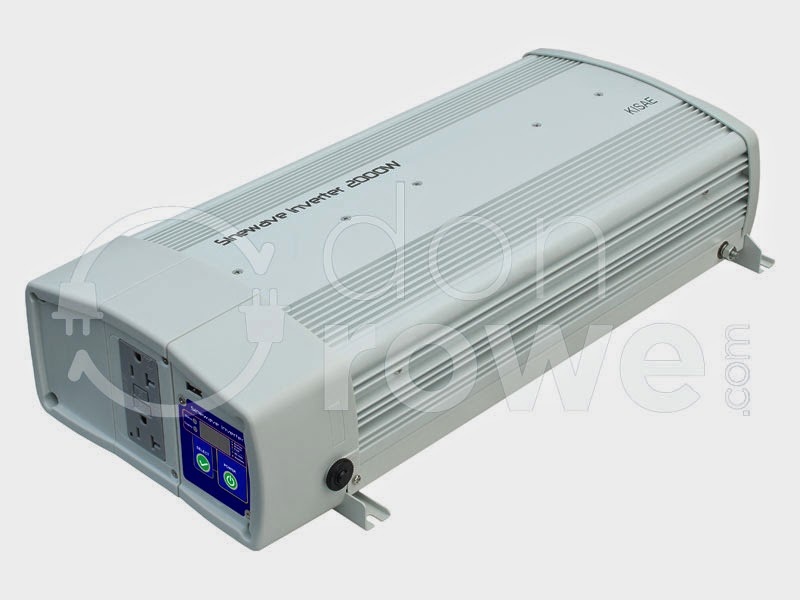 We decided to go with a 2000w inverter from KISAE*. We were going back and forth between the 1000w and 2000w models but decided the extra 1000w's in the 2000 model were worth the $40. We will most likely never come near to using this much energy at once (we hope) but feel like having the option is a good....option. The biggest challenge of this installation was finding a place to put it. It really needed to be placed within 5 feet of the batteries in order to minimize power loss through the cables (again see the * at the bottom). On Hullabaloo our batteries happen to be under the companionway stairs, and with our diesel tank taking up the adjacent room under the (starboard) quarter berth our only real option was to put it in the lazzarette on the port side. Ron has been emailing a couple that live down the lakeshore that have the same boat that did the same trip a few years ago who are not only a total wealth of boat-specific and how-to knowledge, but are very willing to help us and answer questions. They too put their inverter in their lazzarette and have had no problems with it there so we followed their advice. And boy am I glad that we did, we managed to keep it within about 6 feet of the batteries...the cables and cable paraphernalia needed to connect the inverter to the batteries cost almost $300 extra...for 2 cables 6 feet in length!! Stupid, no? The blue control screen also detaches from the unit and can be placed in the boat so you can actually control and monitor the unit without emptying the lazzarette, crawling in and wedging your head against the back of it. Pretty handy. We wired ours into a place near the control panel. We removed an old analog (I think that's what it's called) datamarine unit that probably hasn't been used in 20 years. The kind that measures distance by flipping the numbered dials. Needless to say, our little control display wasn't as bulky. But the inverter is up and running! We thoroughly enjoyed it while watching the first 4 or 5 episodes of Breaking Bad (I know, totally missed that boat!) on a gloomy, rainy, stormy weekend. Livin' the high life now! I generally make it a point to avoid any and all 'home parties' where random over-priced goods are sold by a company rep offering the latest and greatest whatcha-ma-call-it gadget that I can no longer happily live without, but earlier this summer I went to a Norwex party, a company and brand I had never heard of previously. I like the idea behind this company, although I still highly doubt that their antimicrobial cleaning towels are more antimicrobial than bleach (<--actual claim from the rep based on a 'study'). Disclaimer: This claim pertains to antimicrobial properties in the products and not their abilities to sanitize surfaces. 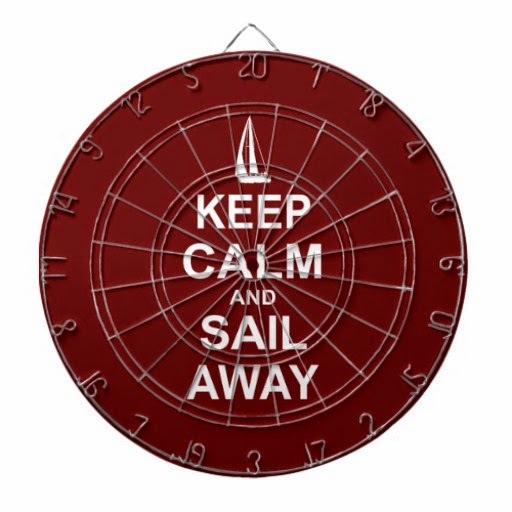 To my surprise, upon persuing their catalog, I did happen to find a couple items that would be perfect for life on a boat. 1). 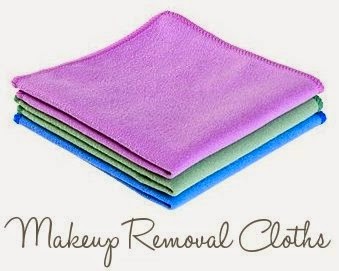 Makeup Removal Cloths - These suede cloths work without soap and remove all my makeup quickly and easily and without overdrying my skin. I use these bad boys for about a week before washing and they've never had even a slight funk to them before washing. 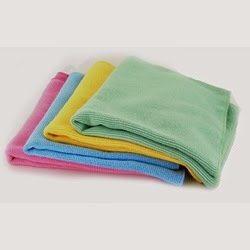 Plus, you can control the level of exfoliation with the amount of water in the cloth. Genius. No soap = less water, always good on a boat. I have also used these in the shower instead of wash rags...makes my skin nice and soft to boot! 2.) Bath Towel - The 'large' towels I ordered are actually only 39"x19" which isn't huge but it's a perfect size for the boat. They're still big enough to wrap my head in and you can get almost completely dry by just lightly brushing your skin with it. 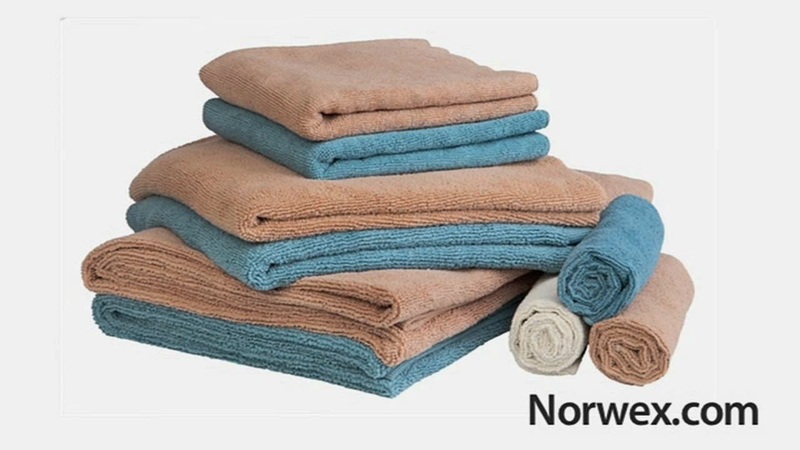 These towels dry crazy fast hanging on the lifelines and they can go weeks between washings without getting stinky. We've been using ours on the boat for 2 weeks (only a couple uses each) and there is NO odor to be found (so far). Last year we made it a point to not go to the boat for the 4th of July. We assumed that that it would be insanely busy and cramped. Too cramped for our liking. This year, however, with projects to be done and plans to have friends aboard, we sucked it up and went to the boat mentally preparing for the worst. Man, are we kicking ourselves for missing last year! The lake was actually less busy over the 4th than the last time we were out...weird huh? Maybe it was the cool, cloudy weather but chaos, it was not. Growing up on a lake that gets insanely busy (and arguably dangerous) on the 4th, we kept looking at eachother and commenting about the lack of boat traffic and people. Maybe Muskegon isn't the major 4th of July destination we thought, which just makes it even more perfect in my book. And the fireworks didn't disappoint either. With cocktails in hand, we had TWO nights of fabulous displays being set off by residents all around the lake that left us "ooohhh"ing and "aaaahhhh"ing in every direction. Then the official show started, again, over TWO nights, and we were even more impressed. All of this from a nearly isolated anchorage in our favorite part of the lake from the cockpit of Hullabaloo. Nice. Where are all the boats?!? Who cares?!? Sigh. I knew it. I was in serious denial before. I tried pulling up our 45lb Mantus anchor a couple weeks ago in dead calm wind...and after a night on the anchor, also with no wind. And I couldn't budge it. At all. I got the boat up to the anchor where the line was vertical but from there...nothing. If there had been more wind the anchor would have been even harder to get up. Not.Good. I stood there pulling with all my might while Ron stood behind me all, "okay, start pulling". What?!? Even when he grabbed the line behind me to help me get the anchor up I was still pulling with everything I had just to get it 'unstuck' from the muddy bottom. Now, part of me is really glad that our anchor sets so well, even in light winds, but the other part of me knows that we might both have real issues trying to pull up the anchor after or during any kind of wind. If that's what we get when we buy such an awesome anchor, I'll take it but that also means we need to add another project to the list. At this point the windlass becomes a piece of necessary safety equipment, and that I don't mess with. No matter how much it costs or how much it interferes with the budget. chain and line into the anchor locker below it. I like. The picture above is on the same kind of boat as ours and is a set up that will be similar to what we'll go with most likely. There are probably people reading this thinking, "I told you so" or "I knew it" or "about time"....well, you'd be right to do so. I stand corrected. I give. You were right - And I'm sure this won't be the last time I say that. We really do need a windlass. But hey, if we need it we need it. Our backs will thank us someday. In (about) 1 year our lives will be absolutely, totally different. We'll be jobless, showering less (let's be honest), living in a mobile home (RV on the water, right?) and heading out on our greatest adventure yet! 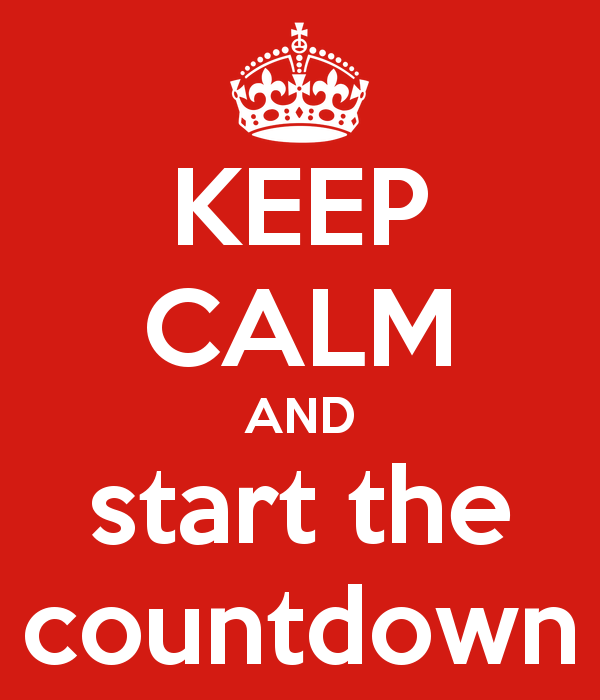 Our grand departure date is slated for somewhere around July 1st (independence on Independence Day seems pretty fitting though), give or take...oh, a few million factors that could change this date. Although we've been planning for this trip for the last 4 years, and I should have had enough time to mentally adjust to what is coming, I somehow don't think I have...or will until the time is actually here. Sometimes there isn't a good way to prepare, you just have to go for it and see how it turns out! I'm a creature of habit, I can be a pretty major homebody and I generally deal with change...not-so-well. BUT, Ron knows this, I know this and I'm hoping that will help. Well, that and my genuine excitement about this whole cruising thing, I'm thinking that will help too! Afterall, this was all my idea to begin with. The fact that we will actually be taking our (floating) home with us should also help calm the crazy. And that's one of my favorite parts of cruising...being able to take (limited amounts of) your stuff, your supplies, your home with you. I know that I'm really beating a dead horse but; I LOVE our boat and knowing that in less than a year she'll be my home is pretty darn exciting (if not a little terrifying at the same time!). It seems like we've already come so far getting to where we are today, but I know that that's a pretty insignificant amount compared to what we've got left to do. I'm trying not to go all crazy cakes over here with my incessant list-making and planning because, really, besides the boat projects and feeding the kitty, there isn't much else that we can do now anyway (oh, there's still plenty of that to do). Sure, it'll go from zero to five hundred in the months before we leave but maybe by then I'll be impervious to the stress. That's what I'm bankin' on anyway. It's getting real over here!